Gatwick Airport has reopened after it was forced to close its runway for several hours following heavy snowfall, but some flights are still cancelled. It reopened at 1445 GMT after a 140-strong team swept 4in (10cm) of snow and ice from the runway, as well as taxiways and stands. But it said all Easyjet and Aer Lingus flights, as well as BA flights, would be grounded for the rest of the day. Passengers have been advised to check with their airline before setting out. Rail passengers have also been facing disruption with a contingency timetable being run by Southern and Southeastern. Sarah Boundy, from Southeastern, said earlier it was going to be a "pretty disruptive service throughout the day". Overnight, temperatures plunged to as low as -8C in parts of Sussex. Network Rail was de-icing trains through the night, along with ghost trains to try to stop ice forming on the tracks. At Gatwick, a fleet of 47 snow ploughs, tractors and other vehicles were deployed in an effort to clear the snow from the runway as it continued to fall. Some 150 staff were drafted in to carry out the operation in an attempt to clear the ground and create safe conditions for take-offs. Regulations require the airport to suspend flights if snow lies thicker than 1.2in (3cm) on the ground. Extra ground staff have also been working in the terminal to deal with frustrated and disappointed passengers facing long waits. Free internet access has been provided to help travellers book alternative flights. 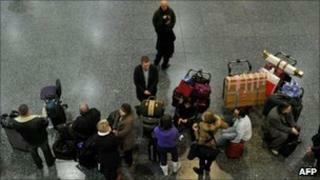 Almost 600 flights were scheduled to operate from Gatwick on Saturday, with at least 138 cancelled by mid-morning. British Airways said all short-haul flights were cancelled to and from Gatwick on Saturday, and no long-haul flights would take off until at least 2100 GMT. On the roads, motorists were told to avoid the A23 due to worsening conditions. Sussex Police issued the advice after five lorries became jack-knifed due to the snow between Patcham and Handcross.